It is our pleasure to submit our second report to the Committee of Management. We have enjoyed a busy first term. It has been full of ‘firsts’ and a constant exploration of new ideas. The connections and relationships we have nurtured this term have been a stepping stone of establishing a sense of belonging (for the children, families and staff at our Kindergarten). The children in both groups are well settled and are becoming increasingly more independent as they move through their Kindergarten days. Our routines encourage independence because they are predictable, inclusive and participatory. Thank you for actively encouraging your child to participate in the morning routine upon arrival. As the children organise themselves and do their jobs, a sense of agency is developed. Circle times denote the beginning and end of our day. They can say goodbye confidently because they know their role and sense of belonging is strong. Thank you for keeping unwell children at home. This ensures that illnesses do not spread and helps children to recover so that they may actively participate in our days at Kindy. We would also like to thank you for ringing ahead of time and letting us know if your child will be away due to circumstances (medical/ personal etc.). Phoning rather than emailing is appreciated because once our program preparation begins we are not using the computer. Messages that are left on our answering machine are always helpful to us so that we may contact you as soon as possible. The children have been very involved in dramatic play. This type of play provides opportunities to reinvent scenes that may take place in other areas of life. The children negotiate roles of people within imaginary classrooms, building sites and family homes etc. Within this role play, the children are testing their ideas and exploring language. They are essentially ‘trying on life’ and developing social confidence. Miss Alanna continues to explore the concept of ‘perspective’ through art. This exciting journey has allowed the children to look at flowers from various perspectives and include fine detail within their artwork. Miss Alanna inspired and guided a connection between art and science. We investigated chemical reactions whilst colour mixing and learned how to manipulate different tools for different purposes. We are becoming more confident in our ‘signatures’ (signing our name) upon our work. Louise also came to the Kindergarten to help us think of ways we can be ‘Loving Our World’. We sang together and discussed ‘reduce, reuse and recycle’ are the significant steps we must take to minimise plastic and help our animals. Louise provided a wonderful interactive experience that incorporated recycled instruments and imaginative dances, all to which the children responded enthusiastically. All staff attended a professional development workshop on Saturday 17th of February 2018. It focused on an introduction into the Reggio Emilia philosophy. The workshop was a valuable catalyst for discussion and reflection upon the Reggio Emilia journey that we the staff collectively began last year. The examples of children’s work and staff planning that were provided are truly inspiring! Miss Jane and Miss Kate attended a workshop on the 2nd March 2018. The workshop focused on ‘emotion management for children and teens with ASD’. It consolidated the knowledge that Kate and Jane had already regarding anxiety manifesting in children. We agree that the strategies and ideas presented in the workshop can be applicable to all children, not just those with Asperger’s Syndrome. Back-to-Kindy Days for the previous years’ groups are an important part of our calendar each year and 2017 Group 1’s was held Tuesday 6th March, with great success. Group 2’s will be held Wednesday 21st March. It’s such fun for the children to return after a month or two of getting used to ‘Big School’ to share their experiences and show off their uniform. Past friendships are strong and hold very happy memories that they may revisit on these special afternoons. Photo days will take place on Tuesday 20th of March for Miss Jane’s Group and Friday 23rd March for Miss Lauren’s Group. Class photos are $25 each, with additional packages available. Please leave an envelope with your order form and payment in the marked box on the sign in table. 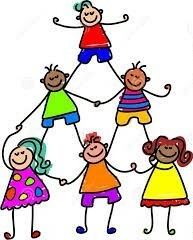 Term 2 begins on Tuesday 17th April for Miss Jane’s Group and Thursday 19th April for Miss Lauren’s Group. Please consult your Term Dates page to confirm attendance days. As this is the last report before end of term, we would like to sincerely thank you for your continued support as we work together for the betterment of all children and their families in our lovely Kindergarten community. We wish you a very safe and happy holiday and Easter celebrations. Our year has begun with a full complement of children in the centre. A staggered start to both groups (half of each group entering the centre for the first time on two parts of a day in the first week) afforded everyone the opportunity to settle in at their own pace, and thus avoid much of the anxiety that usually accompanies ‘first times’. After a few minor bumps in the road we are all truly on the way to happy, secure starts for everyone. Thankfully there have been few absences since our term began. Hopefully this will auger well for the rest of the year! Thank you for keeping unwell children at home until they’re on the road to recovery. By nipping illnesses in the bud this way, epidemics can be largely avoided. The children have settled in well and some friendships are already becoming established. Our emerging curriculum requires input from the children regarding the day’s activities as well as the day to day organisation of meal times and tidying up after ourselves. They have accepted these responsibilities eagerly and look forward each day to the time when the names of the daily helpers are revealed! The introduction of little name tags which are used by the children to label their work with ease has been popular. In the past some parents have been a little alarmed by this because they think that if the children are simply selecting their name tag to name work, they will then cease to practise writing their name themselves. We look on the tags as an adjunct to name writing. They are providing another opportunity for the children to continue to reinforce their knowledge of their own name, as well as those of their friends. When children first start practising their writing, they have to work very hard on the fine motor skills required to do it well. For this they need plenty of space and a smooth, unimpeded surface, along with larger pens or crayons which are easier to grip. It is difficult to name a wet, wobbly collage construction themselves. The independence gained when writing one’s own name on work is more than equaled by a child finding a name tag amongst 23 and attaching it to work unaided. There are always lots of opportunities for the children to practise writing skills in other ways. The Belonging Stones, which were introduced early in the year, are a tangible way for children to quickly connect with their Kindergarten and those in it. Our wellbeing is fundamental to our happiness and children need to feel that they belong here and are a part of a community. They’re part of the basketful of stones so they’re important. Over the past weeks the children have had opportunities to explore their creative side through the presentation of art activities. As everyone comes to feel more confident and comfortable in the Kindergarten environment they will be able to decide on many of their endeavours by themselves. One of our main goals is to give children the opportunity to explore their own strengths and interests through decision-making and free choice. Equipment and materials are freely available to everyone to use as they require. Naturally, should the need arise, we will be there to help stimulate their explorations and assist to send these in the directions most meaningful to them. Outdoors, many of the children are very involved in all aspects of the playground environment. Each day the children have the chance to explore those areas which are always available – ie: sand, water, mud (! ), swinging apparatus, our amazing climbing equipment, etc. Within these areas, there are many new and changing accessories or configurations which alter and evolve as the children’s interests and skills ebb and flow. It is through our observation of the children’s interactions with each other, ongoing discussion with them and the materials provided that we begin to see the path that the developing curriculum will take. Already we have been busy in our outdoor area. The children have helped clear the vegetable patch in preparation for replanting with Miss Mandy when she returns to us. They may plant their own plants so as to begin to create a pot of colour for a special surprise later in the year. We will work together over the year on sustainable practices and a deeper connection to the world outdoors. We will focus on considered risk taking and physical skills which encourage resilience and perseverance. Of course, these traits carry through with us into adulthood. Practising them as early as possible is very desirable. Miss Alanna began working with us in the Art Studio last week. Alanna, our Artist-in-Residence, will be guiding the children throughout the year as we explore the world of self-expression through artistic pursuits. We have begun our journey by thinking about what an artist is and examining the concept of colour and their creation. We have developed a “Colour Recipe” which shows us how new colours are created when others are mixed together. Even the most accomplished artists had some guidance and training in techniques and methods before they could produce what is in their head and heart. In this way, we can give children the skills and then the opportunity to use these skills in whatever ways they see fit. Alanna will work with the groups each fortnight and introduce new concepts and methods for examination. We are already thinking about “Green Things”. We have thought about the way we package our lunch and morning tea boxes and the effect this can have on the natural world. We are becoming more aware of how plastic products in our world lead to greater rubbish creation and danger to sea creatures in our waterways as the rubbish is washed into their environment. We know that it costs families much less to buy food in larger quantities and then use small amounts in reusable containers in our lunch boxes. The tiny cheese and crackers packaging creates no less than three separate pieces of rubbish! We are all thinking about our practices at home and the ways we are already using which help to take care of our world. We will go on to discuss Recycling, Worm Farming, Keeping our Native Bees and Exploring the Work of Honey Bees. The Afternoon Chats to be held this week for each group will provide an opportunity for some common questions to be addressed. Thank you to those parents who are able to come along. If you aren’t able to attend, a small handout with some points of discussion is available for you to collect. This Friday 16 February, Miss Kate and Miss Jane will attend an all-day conference on Emotion Management for Children with ASD. We will then report back to other staff on our new knowledge and how this can further enhance our work with our children and families. The following day, Saturday 17 February, all staff will attend a Reggio Emilia seminar from 8:30am – 12:00pm. This is an Introductory Course conducted by Kirsty Liljegren which will be of great benefit to everyone as we all work further into our Reggio journey as a team and use this information to inform our discoveries alongside the children. Next Saturday 24 February, is our first Working Bee for the year. Families are asked to participate in two of the four Working Bees planned throughout the year. There is a notice on the sign-in table where families may volunteer. If you’re joining us on this occasion, please arrive at 8:30am. We anticipate we will be working for about 2 hours all up. Our Working Bee Co-ordinator will be contacting everyone whose name is on the list for this time. They’ll let you all know what tools etc you will be needing to bring, if you have them. Our first few weeks together appear to be a portent of the year to come - ie: exciting, happy, productive and meaningful! We’re looking forward to many days of fun and sharing with you all. It is my pleasure to present our Annual Report for 2017. My name is Jane Hely. I am Co-Director of Broadbeach Waters Kindergarten. I graduated in 1980 with a Diploma of Teaching (Early Childhood) and have taught in C&K and Gowrie Qld affiliated centres and others since then. I am pleased to have been associated with this Centre since 1995. My role is to be responsible for the development of a curriculum alongside my group and to continue to liaise with parents, Committee and my Assistants with regards to all aspects of the curriculum and the Centre’s general administration. I am our centre’s Nominated Supervisor and with that comes additional curriculum and liaison responsibilities. I am also our centre’s Educational Leader and as such, am responsible for supporting the journey of all educators as they grow their knowledge about children, their learning and development and staff pedagogy. My name is Lauren Regan. I am Co-Director of Broadbeach Waters Kindergarten. I graduated in 2016 with a Bachelor’s Degree in Education, specialising in Early Childhood. My employment at Broadbeach Waters Kindergarten in 2017 is my first teaching position and I have thoroughly enjoyed working with the children and their families in my group. I look forward very much to continuing my association with this lovely centre. My role is to be responsible for the development of a curriculum alongside my group and to continue to liaise with parents, Committee, our Administrator and my Assistants with regards to all aspects of the curriculum and the Centre’s general administration. During 2017 one of our Assistant Educators was Mrs Amanda Bodna. Miss Mandy holds a Certificate III in Child Care and began her association with our centre when both her now grown children attended. An Assistant’s role is to support the Director in the implementation of curriculum in terms of active participation in daily routines and preparation and maintenance of necessary items and materials for daily use. It is also desirable for assistants to maintain ongoing discussion with the Director regarding the children in care and the developing curriculum. 2017 saw us permanently employ our second Assistant Educator, Mrs Kate Galvin, whose expertise is enjoyed each day in both groups. Kate’s role is Support Assistant for children with additional needs. Kate holds a Certificate III in Child Care and has many years’ experience in various forms of children’s services. She worked specifically with particular children but made herself available to all each day, as the need arose. In 2017, our fourth team member, Mrs Jakki Benton, continued her work as our Administrator. She too has been given a permanent position at our centre and we are all very happy about this decision. During this, our fourth year under the banner of The Gowrie, Qld, Jakki has continued to navigate our way through all the myriad administrative responsibilities a centre such as ours has. She is the person who liaised closely with our CGB, the Committee of Management, other staff, the families and the greater community as we steered our way together through the year. During 2017 our groups have worked at consolidating and extending the many skills they had already acquired. They have been helped to recognise their own abilities, see and appreciate self-worth and to understand what impact they can have on their own learning journey and the lives of others. Through the emergent curriculum and the general atmosphere at Kindergarten, the children have been moving towards being independent and secure members of a group who can cope with change, challenge and the occasional failure. The development of these types of characteristics will help children not only in their school years, but also throughout their entire lives. During the Kindergarten year we work on helping each child to develop as a whole. This means supporting children holistically as they navigate through their learning journey and helping them towards achieving their greatest potential in all areas of their life. In 2017, we worked with The Queensland Kindergarten Learning Guideline. This innovative curriculum which centres on socio-cultural development, represents a new way of looking at children, their individual learning journey and the ways in which we as parents and educators can support and enhance their knowledge and appreciation of themselves, the world around them and the ways they think about and respond to all manner of ideas and stimuli. Individual portfolios which parents, children and teachers have access to, contains documentation of our work together, which serves to build a ‘story’ about each child’s development and learning journey throughout the year. As facilitators of children’s learning, we guide and scaffold their thinking and creativity to assist them to gain deeper understandings and knowledge about how the world works. We have continued to participate in Professional Development opportunities including workshops, seminars and active regional networking during the year in order to understand our role in supporting children and families as we work with the document. In particular, as a result of Jane’s Study Tour to Reggio Emilia in 2016, we have continued to explore and work together to understand the philosophy of the Reggio Emilia Program and begin to use this understanding to inform and inspire our work. All teaching staff took the opportunity to attend a 4-day conference in Sydney from 13 – 16 July, which was conducted by the Reggio Emilia Australia Information Exchange. This went a long way towards helping us develop common understandings and knowledge and will pave the way for us to continue to develop our beautiful space whilst being inspired by work that is deeply meaningful to us. 2017 also saw us continuing to recognise and utilise the Early Years Learning Framework. This nationally accepted document provides the framework from which Early Childhood programmes now evolve. The Early Childhood Education movement is continuing to see massive changes and a suitable programme developed and presented by a university-qualified Early Childhood Teacher is one of the major steps towards all Kindergarten children having access to quality education and care. The Queensland Kindergarten Learning Guideline and the Early Years Learning Framework marry perfectly to provide us with a premium resource with which we do our important work with the children in our care. In October 2013 our committee made the momentous decision after 44 years to discontinue its affiliation with C&K (formerly known as the Creche and Kindergarten Association) and align ourselves instead with The Gowrie Qld by nominating them as our Central Governing Body. This decision has been an extremely good one for us. Gowrie’s representatives, our Advisors, Melissa Lee and then upon her leaving on Maternity leave, Fran Griffiths, made themselves available to us at all times and visited often to support us through the provision of advice and resources and sometimes a listening ear. We feel that the philosophy of The Gowrie matches our own in terms of their support for our centre’s autonomy and how we go about recognising and meeting the individual needs of our particular community. We look forward to our continued association for many years to come. To supplement many aspects of the developing curriculum, and to interpret the curriculum for parents and other interested parties, it often helps to have visitors to the centre or to travel away for the day, and 2017 was no exception. Such visitors included Sue Jordan and her Fruit and Vegetable Puppets, Crocs and Dragons wildlife presentation, the magical incubator from Living Eggs which produced a clutch of beautiful baby chicks, the Koori Kids Show and Michael Smith with his Little Theatre puppet productions of The Three Bears and The Christmas Nativity. A Fathers’ Morning was held in March so that the Dads could visit the Centre with their children for some fun, and a Fathers’ Night was held a few days prior to Fathers’ Day. Mothers were treated to an Afternoon Tea made by their children to celebrate Mothers’ Day in May. 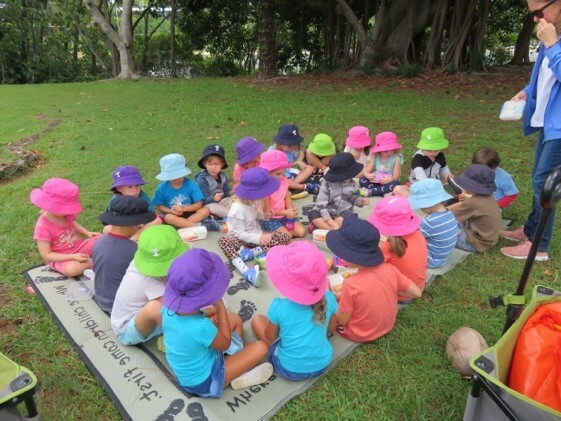 In July, in order to extend their connections with the natural world, the children took part in a bus trip to the Numinbah Valley Environmental Education Centre. For many, the highlight was the trip in the bus but the exploration of the environment, the discovery of animals, their habitats and their methods of survival were fascinating for everyone. To have a python within touching distance, and for parents and teachers to feel calm about this was truly remarkable. We were all so well educated about these beautiful creatures by the end of the day, we knew we had nothing to fear. What a wonderful job the staff at this remarkable facility carries out. Parents were encouraged to participate on roster days and in our daily activities. Parent interviews, whether planned or impromptu were conducted. A Back–To–Kindy Day was held in March for both of our 2016 groups in order that these children could come back together for an afternoon to renew their acquaintance and discuss the enormous step they had taken into “Big School”. These were a great success once again. As part of our ongoing commitment to sustainable practices within the centre, our worm farm was maintained and added to. The children entered into this responsibility with great enthusiasm. Following group discussions and decision-making, routines were devised where food products from lunches were sorted and used to feed the worms and which were to go home. The “worm tea” which is produced has greatly enhanced the health of our gardens. We sell our excess supplies to the community and donate this money to the Leukaemia Foundation, with whom we have a strong tie. Miss Mandy has been responsible for working with the children to maintain our vegetable patch, and under her skill and guidance it has yielded great harvests. Not only did we spend time working in the garden and feeding the Worms, we also researched and investigated our Native Bee Hive and how we support Recycling, protect Water Consumption and the significance of bringing Litter-free Lunches. These are all practices that fully support our Kindergarten’s Philosophy of connecting to, respecting and caring for our world. One special visitor this year contributed greatly to our sustainability practices. In 2016 we were able to introduce an Outdoor Teacher to our team. This year that role was filled by Ms Skye Warner. It had been a dream of mine to incorporate this special area of learning into the Broadbeach Waters Kindergarten since visiting Mia Mia, the Early Childhood facility at Macquarie University in New South Wales more than 8 years ago. I was so inspired by their practices that I returned a year later to consolidate my thoughts. Skye’s passion for nature and sharing her ideas, stories and skills with the children has been so meaningful for us all. We introduced a fortnightly visit for each group to the small glade by the river on the western end of the large park that is behind our centre. To do this, the children have been deeply involved in its planning. From Risk Benefits Assessments to making lists of “provisions” to take, the children have had important input. This is for them, so it must be by them. It has been a huge success and the children’s passion has been ignited. Although Skye will not be returning in 2018, we will continue to offer these kinds of experiences to the children as we maintain our interest in and connection to the natural spaces that surround us here at Kindergarten. Living and working in our environment both inside and outside the Kindergarten gate marries perfectly with our Reggio Journey. Our Artist in Residence programme continued to be enjoyed by both groups throughout the year. Mrs Alanna Swanson worked with the children as they pursued painting, drawing and construction interests and deepened their knowledge about art, perspective, techniques and terminology. One only needs to peruse the room and the magnificent portfolios which were created to see how highly successful this endeavour was on so many levels. This programme continues to be of great value to us as each year we see so many benefits to the children as they gain and then use this new knowledge. Our Japanese language programme was conducted by Mrs Emily Moryta of Nikko Nikko Japanese School. Both groups enjoyed Miss Emily’s lessons for 15 minutes each week. The progress made by all the children gave testament to the well-researched fact that learning another language is most successful when begun at a very young age. This process also serves to further enhance language development in a child’s native tongue. The synapses in the brain continue to fire and develop at a much greater rate when given these opportunities. We look forward to our continued association with Emily in 2018. Also during the year staff members attended various meetings and conferences which all served to enhance our professional development and working relationships with each other. All staff attended their annual First Aid Training days and Child Safety Seminars throughout the year. This year we continued to offer Playgroup sessions to our local community. Playgroup ran on Tuesdays and Fridays from 9:30am – 11:30am during term time. In Term 4 it was reduced to Tuesdays only in order to try to lower costs. It has been facilitated by Ms Skye Warner. She has been supported by a constant team of dedicated and committed Volunteer Workers. We are very grateful to have had them all with us in 2017. Towards the end of the year we saw an increase in numbers as families began to learn of the meaningful program Skye has presented. It was the first connection to our centre that families can make and it was important that it was a high quality connection. Unfortunately, due to the excessive costs of running such a wonderful program, our centre will not be offering Playgroup beyond 2017. Although this has been a marvellous opportunity for many families, we believe that support for the Kindergarten itself must remain our priority. Our centre’s progress and enhancements would not be possible without financial assistance. We continue to work towards long-term goals with the assistance of grants and funding applications. Members of the Kindergarten community who spend many hours completing forms and organising quotes are of invaluable help and we are very grateful. We believe that in an effective curriculum, the teacher’s role is to enhance learning through supporting children to plan and strategise their own learning journey. We encourage, scaffold and value children’s spontaneous learning. It is through this method that a child’s learning is individualised and meaningful. The children, teachers and other partners, such as parents and colleagues, co-construct the curriculum. We believe it is a partnership for all concerned. A child’s perspective of a curriculum involves participation in interactions with peers and supportive adults in a flexible, inclusive environment. As learning is a socially constructed process, children learn best when teachers actively engage with them as they play, observe, explore and interact with people, materials and ideas. Our curriculum here at Broadbeach Waters is play-based and occurs most effectively in natural, beautiful indoor and outdoor settings. We believe that children can best be supported by ensuring that their play and real-life experiences are purposeful, integrated and relevant to their needs, interests and abilities, as well as their family contexts. We aim to provide direct, first-hand experiences which are set in meaningful contexts with due consideration given to the entire range and diversity of each child’s needs. We believe that this forms the basis for effective learning. Broadbeach Waters Kindergarten continues to enjoy healthy enrolment numbers despite the far reaching effect of the introduction of a pre-Prep year in private and Catholic schools, and now, in many cases, an onsite Kindergarten at some State Schools. The added pressure of the introduction of Pre-prep (Kindergarten) classes in schools on the Gold Coast is having an effect to a degree, but this appears to be placing an unwarranted pressure on families. These schools are forcing parents to make decisions about their child’s place of education at an extremely early stage and are, in effect, saying that the Kindergarten year is compulsory if they wish to ensure their child’s enrolment at the school for the higher grades. Kindergarten is not compulsory. Parents are being placed in an untenable situation. The Federal Government’s pledge to have University-trained Early Childhood Teachers teaching all 4 year olds in the country for a minimum of 15 hours per week, as of 2012, has meant significant changes in what is offered here at our centre to our families, as well as in our working conditions. Whilst both Co-Directors are University-trained, the alteration in working conditions has meant longer contact hours, greater administrative pressures and ultimately, more expense to the centre. This will continue to affect the fees our families are asked to pay because no extra funding will be offered from the government. Despite these conditions it is clear that we are still able to offer families a unique and highly sought-after option. New equipment is purchased throughout the year. In 2017 we were fortunate enough to be able to add to our extensive variety of book, puzzle and games resources, which is always a constant need. In 2017 we have worked closely with the Palm Beach Scout Group to construct a Chicken Coop. We are hopeful that this structure will be completed in time to welcome some new feathered friends early in 2018. In the meantime, some Kindergarten community friends will bring their chickens to visit before this year ends so that the children can see how the coop will work for our own chickens when they arrive. We have plans to construct an additional room, an Atelier, here at Kindergarten in 2018. This room will reflect the renewed view we have on the children’s ability to express their ideas and thoughts through artistic pursuits. Miss Alanna, our Artist-in-Residence will work with the children in this space when she visits, but it will be a place to work in every day. We are very excited about this goal and motivated to see our vision come to fruition in the not too distant future. The Centre’s lawns and gardens were maintained throughout the year by our gardener Henery Siennicki and parents who willingly participated in Working Bees. Our spear pump has protected the playground from drought damage and we also have the use of our large rainwater tank to supplement our activities. We are hopeful that we can top dress and refurbish the grass in our playground. It certainly gets a constant workout! On November 10, 11 and 12, 2015 we underwent our Assessment and Rating Visit, which was carried out by Ms Chris Manners, an Authorised Officer for the Office of Early Childhood Education and Care. We were examined under the National Quality Standards, which contain no less than 58 individual elements covering 7 Quality Areas. This was a massive undertaking by all staff and we looked forward to receiving our rating at the end of the year. We were thrilled to learn that we received the highest possible rating where we received “exceeding” in every Element of every Standard of every Quality Area. We will be working towards achieving the top rating of Centre of Excellence in 2018. We feel very confident about our ability to do this. In conclusion, we would like to thank both Mandy and Kate for their wonderful support once again during 2017. Mandy and Kate are the carriers of information as it passes through both groups. Their commitment to their job and to our centre is unmistakeable and we are grateful for their wisdom, expertise and willing participation in the continued progress of our lovely kindergarten. Jakki Benton, as our Administrator, continues to be her organised, reliable, loyal and committed self. We thank you very much indeed Jakki for your important contribution once again this year. We look forward to another year of collegiate support wrapped in good humour and grace in 2018. We would also like to extend our congratulations and truly sincere thanks to the Committee of 2017 for their dedication to the continued growth of our Centre and for their hard work and successes. It has been another challenging year with some important decisions to be made and the manner in which all situations were handled and prepared for was exemplary. Our President, Mrs Kate McFall took the helm with her calm, inclusive leadership and continued our path in the right direction. Thank you all. We bid a hearty welcome to our incoming committee and look forward to a very enjoyable, successful and without doubt, interesting 2018. Kindergarten – a place for friends and fun. Once again, it is our pleasure to present our monthly report. Our groups continue to enjoy their full complement of children. We welcomed Napat and his family to Miss Lauren’s group this month as a vacancy had arisen after Ryan and his family moved further south. Generally, the health of the centre has been good over the past weeks although half of this has been spent away from the Kindergarten due to holidays. We hope to continue to keep the community healthy as the cooler months pass by. As usual, we are grateful to families for keeping unwell children at home so they can recover and so that no one else catches the germs. Handwashing continues to be a major focus for us as we encourage the children in personal health and hygiene. Upon both groups’ return for the new term, new directions are already being pursued. The children are continuing to pursue an active interest in our gorgeous outdoor environment. There are many Chasing Games and other collaborative projects being carried over from last term. There are concerns about working together to discuss so that everyone is safe and happy. The children respond well to these types of efforts and as such are keen to be fair and just. This skill is essential to be able to negotiate our world, so practice in this environment is welcome. Skye’s return this term has seen a new interest in camp fires. We have been very fortunate to have been given a fire pit by Bunnings’ and it’s already been put to use. There were long, earnest discussions about what safety considerations needed to be taken into account and preparations were made together beforehand so everyone’s safety was ensured. When these kinds of challenges are put to children, they draw on all their previous knowledge and rise sensibly to the occasion. We enjoyed preparing the fire together before Skye used her flint to light it. We watched as the adults toasted marshmallows over the flames. We sang songs and watched the fire dance and the smoke billow skyward. Afterwards, some children helped to extinguish the flames and discard the remains after collecting the cool charcoal for use in our drawing. Both groups are thinking about the world and its myriad lands and peoples. By looking at our own family origins we will be beginning to develop a deeper understanding of the innate connectedness we have with many other cultures and indeed with each other. Everyone hails from somewhere and by exploring those similarities and differences we can come to see our common threads and in turn feel more empathy and interest towards others. There will is a display on the wall in our entrance foyer, which shows just how far some people have travelled to eventually become a part of our Kindergarten community. It is fascinating and really heartwarming. Please take a look! A definite highlight for everyone next week will be our excursion by bus to the Numinbah Valley Environmental Education Centre. This experience never fails to have a profound and long-lasting effect on all who have it. Everyone has received their relevant notice by now. We like to have as many adults join us as possible on this journey. One per child is our ideal situation. Miss Jane’s group will have their day on Tuesday 25 July and Miss Lauren’s children will go on Friday 28 July. Miss Alanna will return this term in her role as Artist-in-Residence. The children will be exploring the art world further under her guidance. Initially she will be helping us all acquaint ourselves further with clay and how we can use certain techniques to express ideas and understandings. Japanese lessons began this term. Miss Emily has visited both groups now and the children are learning songs and games and with these, new vocabulary. A greeting song is already familiar, as are the names and sounds of some well-known animals. It is so interesting to hear how easily the children can recall words and phrases just learned. They truly are in an ideal position to develop and remember this knowledge. Miss Emily’s cheerful and enthusiastic presentation helps keep the children focused. Last week, all teaching staff attended the biennial Reggio Emilia Australia Information Exchange Conference in Sydney. Following Jane’s amazing trip to Reggio Emilia in April 2016, where she embarked on a week-long intensive Study Tour, the natural progression to a group experience was obvious. The Reggio Emilia philosophy is not one that can be written on a piece of paper and passed around so everyone will become knowledgeable and confident about utilizing its ideas in their own individual contexts. The Reggio Emilia Education Project is already over 50 years old and continues to evolve and change as the teachers and other staff immerse themselves in it. It was born of a vision of Loris Malaguzzi, who was a teacher in Reggio Emilia following the second World War. He believed that the way children learn and develop should be paramount to the work undertaken with them by teachers. The centres in Reggio Emilia are inextricably intertwined with the local community as well as the wider context of Italy. They do not provide us with a model, but rather the opportunity to reflect on our own educational theories, practice and organization. And reflect we have! The four conference days have given Jane, Lauren, Mandy and Kate an incredible opportunity to think about our own beliefs about how children learn, what our role is within their learning, how we can best facilitate what we believe to be their individual explorations of their own identity and all that this entails. We arrived back on the Gold Coast brimming with ideas about how we can all move together towards changing the ways we work with our children so we can honour their identity and do their journey justice. We are all agreed that we must go slowly as we adjust our thinking and methods of working. We will meet and reflect on a very regular basis so as to adjust as necessary. It will be about utilizing our time each day in ways that allow us to work with the children in much smaller groups so as to be able to truly engage with individuals and actually listen so as to hear what they are trying to tell us about their self-awareness and their perspective on their world. To do this we are experimenting with ways to support each other so we can all take moments alone with small groups for meaningful conversations and experiences. This conference was a “gift” to us that will change us professionally and we will always be very grateful for the support of our Committee as we take our new knowledge and inspiration forward. Prior to the end of last term, we began to make contact with the families whose children will join us in 2018. It is hard to believe that this time is once again upon us. We will soon begin organizing the distribution of Enrolment Packs and holding Orientation Days and Play Days. It appears that our groups have already reached their full complement. There is a notice on the sign-in table asking families whose children are going to Prep next year, to write down which school their child will go to next year. This gives everyone a clear picture of who else their child may know and encourages us all to begin to establish connections. If you’re still deciding on particular venues, you’ll also be able to use this list to chat with other families. Thank you all once again for your support as we begin new journeys and continue to relish our days together. It is our pleasure to submit our report to the Committee of Management for the month of May. We continue to enjoy a full complement of children in both groups and no changes to this are anticipated. A number of families are taking holidays in the near future and we thank them for informing us ahead of time. We hope you all have a wonderful time and look forward to corresponding with you over the period your children are not with us. Inclusion is an important aspect of our Kindergarten philosophy. With our community and families’ needs in mind, we aim to promote diversity and equity so that people with additional needs may have equal opportunities to grow and learn. Research has shown that inclusive practice can be a positive experience for all involved. Children are able to develop mutual respect and acceptance of difference. Qualities such as empathy, kindness and connectedness are encouraged when children’s questions and discussions about differences are approached pro-actively. Our Kindergarten has children with additional needs and we work closely with them and their family. We thank the parents and caregivers who continue to sensitively promote positive feelings about difference and uniqueness. After the delivery of eggs to Kindergarten in the final weeks of last term, the children had to exercise patience whilst waiting for the chickens to hatch. Once the process had begun, eager faces crowded the incubator to watch the baby chickens. The children discovered the life cycle of a chicken and discussed how to take care of them. Designs for the chicken coop being created by the local Scout Group were created and drawn by the children and an interest in nests, eggs and birds in our natural environment was stimulated. Miss Jane’s families were able to enjoy a final day picnc celebration in the garden which was a great opportunity for families to come together, but unfortunately Miss Lauren’s families’ celebration was caught in the crosshairs of the terrible weather the Gold Coast endured at that time. It’s hoped another get together can be planned at some stage during Term 2. Whilst Miss Jane was in Europe visiting her daughter Claire, Miss Lauren worked with her group for the first two weeks of Term 2. The children loved having a new teacher for these days and upon Miss Jane’s return, regaled her with tales of what Miss Lauren “read”, “said”, “sang” and “played”! Even though Miss Mandy and Miss Kate were here as usual, being able to adjust to new and unexpected events and people, indicates growing emotional resilience and self-confidence. Life is full of unexpected things and the internal strength to cope with this begins growing from the earliest of days. As Term 2 continues, we are seeing more confident artists and engineers. The children are comfortably engaging with the diverse experiences that are offered. Mathematical learning is increasing in a child led, incidental way. As the children arrange resources/materials (including your recycled collage materials), they explore relationships between objects (symmetry, one to one correspondence, dimension and patterns). Castles, robots, dolls, cars and other interest-driven creations build foundations for children’s understandings of concepts such as number, algebra, measurement and geometry. The ability to problem solve and perservere during their design process shows high level thinking and reasoning. Our Nature Days with Miss Skye have begun with great success. Miss Jane’s children have ventured over to the park, after many discussions about the excursions. Miss Lauren’s children will have their turn this week. They have made lists about provisions we may need. They’re thinking about how to be safe when we leave the Kindergarten grounds. What can we do to help each other? What can we do to protect the environment we’re visiting? What will we find when we’re there? What will we do when we’re there? Who has been to ‘forests’ before? What knowledge can you share? They are able to make deeper connections with the natural world as they engage in safe risk taking (such as climbing a tree or walking across the carpark). The children enjoy ‘fishing’ in the river with self-made rods and nets. They also enjoy finding interesting things such as textured branches, birds and stones! In these ways, the children are feeling empowered to develop new skills and a sense of confidence in their own capabilities. We look forward to many adventures together. Miss Alanna has continued to work with the children as they explore colour and its properties more deeply. Experimenting with mixing colours encourages children to dive into the mindset of exploring their ideas and how to express them. The process of thinking creatively when they are presented with different materials/resources is a valuable skill. The children also began to understand the impact of their ‘signature’ as they practiced writing their names. Miss Alanna introduced the concept of patterning and how they can be seen and found every day in the world around us. By creating patterns (in different contexts) the children are developing early numeracy skills such as counting, shape recognition and sequencing. She has returned this week for Term 2 and we have been working on ‘sketching’. Please feel free to have a look in the Art Studio to see our work. Thank you for actively encouraging your child to participate in the morning routine upon arrival. As the children organise themselves and do their jobs, a sense of responsibility and confidence is their own abilities are developed. Morning discussions on the mat are often stimulated by artefacts, ideas and experiences that the children wish to share. (Topics have included meteorites, nests etc.). If the children would like to bring something in, we encourage them to find something special that “no one else has ever seen”. Whilst we acknowledge the boys and girls might need a ‘cuddle toy’ at rest time, we want to minimise the bringing of toys from home. We have lots of resources at kindergarten for the children to play with and we find that personal toys can often limit their engagement throughout the day and create a sense of anxiousness because they do not wish to share. These loved toys can also be lost or damaged during play times. Miss Jane and Miss Lauren attended a Professional Development Workshop on Saturday 18th March. The workshop was valuable and presented theory and strategies of how best to assist children in developing executive functions. These functions include self-regulation, listening and memory skills. This workshop inspired the Kindergarten to be involved with an early childhood study that will be conducted by QUT and Monash University. This study will begin this term, with a researcher coming to the kindergarten to observe the children and their use of executive functions. You will have received a notice about this and if you already have not done so, please return your permission slip to us as soon as you can. We have two students with us here at Kindergarten. Erica Lambden began working with us last year as a volunteer and as her interest in working with young children and their families grew, she decided to undertake study. She uses her time with us both in assisting Skye at Playgroup and working with both groups at Kindergarten to fulfil her Practicum requirements as part of her course. We also have Fernanda Da Silveira, who has joined Miss Jane’s group on Tuesdays. Fernanda is studying a Diploma in Child Care through TAFE and will be with us for the rest of the year as she fulfils her study requirements. The students have the benefit of seeing and participating in high quality education and care programs and when we have the involvement of mature, focussed and dedicated students, our work with our families is enhanced. Our Mothers’ Day celebrations have been held this week. To date, Miss Jane’s children welcomed their Mummies, along with a special Grandma and a special Popa, to lunch yesterday. It was a great success filled with lovely gestures and special moments. Miss Lauren’s Mummies will participate in their beautiful lunch on Friday. The children will have prepared surprises, some songs and helped make beautiful meals for some very important people in their lives. We wish all Mums the happiest of Mothers’ Day and hope some special memories are made for you. Our next Working Bee has been rescheduled from Sunday 21 May to the following weekend, Sunday 28 May. Please see the notice on the sign in table where you can write your name down if you would like to participate this time. As our second term zooms along already, we thank you all once again for your support and participation as we work together for the children and our beautiful Kindergarten. It is my pleasure to present my report for the month. A full complement of children continues to be enjoyed by both groups and no changes to this are expected in the foreseeable future. All positions for our 2017 groups have been filled and an Orientation Day for these families was held on Wednesday 14 September, 2016. There will be further opportunities for families to connect and familiarise themselves with our beautiful environment before starting in the new year. Generally speaking, the health of everyone here at Kindergarten as we moved towards the end of Term 3 and into Term 4 was good. Occasional absences due to various illnesses occurred but thankfully these were shortlived. Following last month’s report, the centre closed for the Term 3 holiday, when a well-earned rest occurred for everyone. During that time, Mandy, Jakki and I attended Kindy over several days to prepare for the new and final term together. The room was completely redesigned and Mandy and I set about recreating the environment so as to place new emphases on areas which encouraged the children to explore and experience their familiar environment in a whole new way. Upon both groups’ return we have found this to be the case. It has been a positive change and new work and projects are emerging. In Term 4 Group 1 has enjoyed a visit from Aunty Di, a member of our local Aboriginal tribe, who presented her “Koori Kids” program. The children engaged with her in a corroboree where they discussed “the tribe’s problems” together and discussed how to solve them. They danced to the beat of clap sticks and acted out animal movements. They thought about all the food that the tribes could find and catch in the bush and the ocean. The boys tried their hand at playing the didgeridoo. Girls are not permitted to play this instrument due to aboriginal rule. Aunty Di needed to gain special permission from the elders to be able to demonstrate its sound. We finished the wonderful sessions by having our face painted with authentic white ochre. The children chose which animal they wanted to be – a shark, bush butterfly, koala, goanna to name a few. Group 2 will enjoy this same experience on Thursday 13 October. The new term also meant a new way of working with the children for Mrs T in her role as our Outdoor Teacher. After much preparation and discussion, we have finally begun our “Nature Days” and the first was held last week for Group 1 with enormous success. The children were completely engaged with the environment on the far side of our local park. They moved freely through the bushes, trees, water’s edge and leafy undergrowth as they explored this gorgeous and mysterious environment. There were opportunities to be creative and to challenge ourselves. We will continue to support the children’s ideas about how to enhance their connection to this place and to extend their work there so as to make it relevant and challenging. We are all looking forward to presenting the same opportunities to Group 2 from next week. Mandy and I will be attending a Reggio Emilia Australia seminar this Saturday 15 October at the Southern Cross University campus at Tugun. We are looking forward to exploring the Reggio philosophy together and hope to bring new insights to our work with the children as a result of this occasion. We are also anticipating being able to share our knowledge with Kate and Jakki, as well as the families as we incorporate more and more of this philosophy into our work. Barefoot in the Park will occur once again this year. It will be held in Firth Park, Mudgeeraba on Wednesday 26 October from 10:00am-1:00pm. Please see your separate notice outlining details about this very important day in our centre’s calendar. We look forward to seeing you all there. We look forward to our final weeks together. This is always the most exciting and eventful time of the year for the children, and it passes by so quickly. Don’t blink!